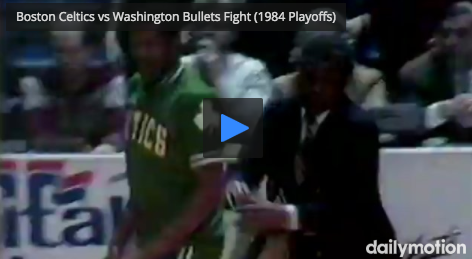 Bill Simmons reminds us on the eve of the Celtics series with Washington of how our last playoff series together ended. There's been some bad blood between the two teams this season, but don't expect a similar occurrence. Not even sure if this would be considered a "brawl" back in the 80's. Maybe more of a skirmish. In 2017 though guys would get suspended for a ton of games. Would never happen. The most hilarious part of this video is the combination of fighting and players on opposing teams wishing each other well after a hard fought series. For the record I saw a Bullets player give a cheap shot to Gerald Henderson's back to start the fight. Would love to hear Johnny Most's vocals to the video.